= free time to do some tune-ups at blog.vitummedicinus.com. You may not have noticed all the upgrades, especially if you're reading VM in a RSS reader. In order that you don't have to pore over the blog looking for them like a radiology resident scanning an x-ray film (I had to tie in that photo somehow), here's the improvements listed for you. I had to change it anyways since I grew a year older since I started this blog; but I figured I might as well change the photo to something that actually happened in medical school, rather than something I did during my pre-med years. This photo was taken in a hospital on my cell phone camera when a bunch of us were waiting around for a pediatric clinical skills session to start. My favourite part of it is the subtle tribute to Canadiana - there's a Tim Horton's coffee cup sitting on a table in the photo. a.k.a. Vitum Posticles Popularis, now available in the right-hand sidebar as an easy springboard for anybody who wants to read the best of VM right away. None of the fluff. Just the top stuff. Favourites include First Post, First Breast Exam, and the Top 10 List Category. By becoming an RSS reader user I developed a lot more respect for those who use RSS readers, especially those who read VM via RSS. I also developed a healthy bit of embarassment at this up-until-now-ignored aspect of my blog, and now that I've delved into the world of RSS I added Feedburner RSS feeds to maximize the functionality of my feeds. Subscribe to Vitum Medicinus via RSS... or get a Feed Reader (Google Reader is great). For those of you who, like me, are reluctant to jump head-first into RSS without really understanding it, you may prefer to get VM posts e-mailed to you whenever they're written. If so, you can subscribe to VM via e-mail. For those of you who care about your friends enough to share a VM post with them, you can now post a VM story to Facebook or del.ici.ous thanks to the convenient links at the bottom of each post - whether you're reading it on VM or in RSS. Okay, this one is kindof just another post on VM, but it's included because it's a tool for people who - like me just over a year ago - don't know Web 2.0 from a medblog. Especially important now that I've indicated that reading medblogs is important for any pre-med. 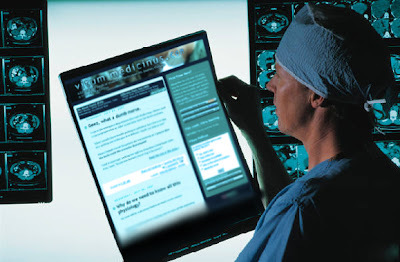 Check out Vitum's Guide for the New Medblog Reader. If you have any more suggestions on how I can improve your VM reading experience, please let me know by comment or via e-mail - and thanks to those of you who have been kind enough to bear with me as I tinkered with the settings of VM, or have suggested improvements already. I swear I was being good. Really, I was! Honest! But still, they hunted me down and cornered me, like an angry, bloodthirsty pack of shewolves avenging the death of their young. Or something like that. Tonight, during a ER shadowing shift, I was sitting unsuspectingly at a computer (I don't know how else to sit), looking up the difference between ringworm lesions and lyme disease target lesions. You know, minding my own business. I thought I heard some nurses off in the distance saying something like "student" or "medical student"... but I brushed it off and ignored it. I went back to my googling. I felt a massive shadow coming up behind me. I turned around... in time to see half the ER nursing staff approaching me in a pack akin (great word) to a pack of shewolves (yes that word is worth the repeated reference). I hadn't done anything wrong (other than written a certain blog post several weeks ago which shall remain unnamed here) but I figured I was screwed. I felt like those folks must feel when the infamous Sumdude - a.k.a. 'some dude' - jumps them without warning, rhyme, or reason. By the way, for those who don't know, Sumdud is an emergency medicine phenom (another great word) documented by paramedics, respiratory therapists, nurses, and doctors alike. Anyways, they surrounded me, towering over me - only because I was sitting down - and shone a light in my face. And thus they began their brainwashing session. "Be nice to nurses!" they said. "Nurses know best." The skinny one in the back of the herd adjusted the giant, whirling spiral which I can only assume was meant to hypnotize me into oblivion. "And nurses love coffee - bring your nurses coffee." I shifted uncomfortably. Their tactics were working. I was feeling their efforts to convince me were working. I nodded my agreement in an attempt to signal to them that the giant stainless steel probe they were holding just inches from my face wouldn't be necessary. Okay, I was wrong about the light, the whirling spiral, and the probe. But a group of nurses did corral me today, and did tell me to be kind to nurses. They were mostly joking, but obviously there is a certain level of seriousness to their comments - I'd be dumb to assume that these nurses haven't been cruelly treated by a doctor at one time or another - though the doctors I was working with today were outstanding. Fortunately I was able to explain to them the same thing I said in that other, previously mentioned but unnamed post, that I've been told all this already by my nursing friends and my nurse mother. I wish this story had a more dramatic ending, but that was it, really; my comments seemed to appease them. The rabid pack broke apart, most of the nurses wandering off into the meds room, still laughing about their indoctrination method, and sharing stories of nursing back in the days when nurses used to stand up when doctors entered the room and mustard poultices and turpentine were common treatment methods, and I went back to my Tinea corporis and Borrelia burgdorferi. Thanks to the good folks at 103bees.com (leaving out the "www" is the latest thing now, you heard? It's supposedly redundant), I have been quite entertained over the past several weeks taking note of the ways people find Vitum Medicinus using search keywords. Every so often, I'll see that someone came here through a search term and I wish I could find out who it was so that I could say something to them. So, in hopes that any of these individuals who stumbled upon my blog (and obviously did so quite unintentionally) have subscribed to VM via e-mail or through a feed reader or check back regularly, and will therefore read this, here is what I have to say in response to your search engine phrases. (If this was actually you, I and everyone else here would be quite interested if you'd leave a comment explaining what was going through your mind when you searched that). And before you approach me asking "Did someone actually..." I will swear on my hamster's grave, I made none of these up. "Best way to separate frozen burgers"
I can understand how you'd get to this website if you search that, but until Vitum Recipicus® is born, you won't find the answer here. You'd only find how not to separate frozen burgers, something I learned from a surgeon...who did it the wrong way. Really... Chaque a son gôut (to each his own), I suppose... but I never made that claim on this website. Who would have thought that perhaps my most racy blog post (posted in the name of science, of course) would be one of my top search phrases? Okay, I suppose I should've guessed. Here is the blog post you are looking for. I won't ask...'nuff said. Please don't tell me you actually want to buy these. People are such corporate marketing patsys. Then again, people are influenced by marketing to a frightening degree even in preschool (Children believe carrots in McDonalds packaging taste better), so I won't blame you as much. One thing I do love about this search term - as of right now, when you search that term in Google, my blog turns up higher than the actual website that you can buy them from. Perhaps I should start selling them. Finding and memorizing empathetic statements is probably not going to make you more genuinely empathetic. Oh wait, that's my med school's entire strategy to make us more empathetic. Has it worked? It might make us seem more empathetic, but are we really? The jury's still out. Indeed, it is your summer. "Chest tightness+gets worse in summer and late in day"
Thanks for coming to my site, but on this one I'll have to say, Please do not google your symptoms...especially if it has something to do with chest pain! Not only will no blog actually offer medical advice AND say you should take it (hence the Finus printicus below), but you should go see a doctor if you're sick! "How to give medicine to the patient"
"Take my MCAT for me"
This one kindof frightens me. I know I don't want a doctor who made it to medical school because he paid someone to take his MCAT for him. "Why do we need our lungs"
Either someone was 1. extremely, extremely, extremely bored or 2. so clueless they might actually do an autopneumonectomy (I made that up) if they can't find the answer on Google just to see what would happen. I'll ignore the obvious joke potential and not use this opportunity to make another joke about one of my naturopath or Caribbean medical student friends (whom I insult often and only ever in good fun because I actually do respect them). I've written a few posts already about how medicine has started to take over my life. Apparently, it doesn't necessarily end once you've become a doctor. A doc at a rural conference I went to told me that in order for them to take a day off, they need to literally leave town. Why? They explained as follows. One day, early in their career in the town, the doctor was enjoying a vacation day with his family. The phone rang, and the doctor picked it up. "Doctor, I need your help please." The doctor explained, "Sorry, today is my day off," and made a mental note to not pick up the phone during his next day off. The next time he had a day off and the phone rang, he decided he'd let the machine get it, just in case it might have something to do with work. Sure enough, the message started out, "Doctor, I need your help..."
"Doctor, please pick up the phone, I know you're home, we can see your car in the driveway." And that's why doctors in a small town need to leave if they want a break from work. Yep, medicine can take over your life. You've eaten a Canada goose. You've body checked your preceptor during a hockey game.